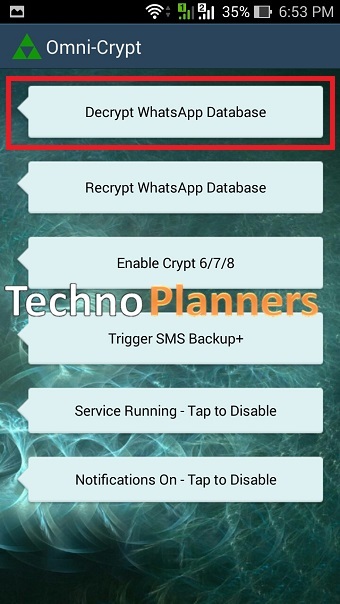 Tutorial - Now You can Convert your WhatsApp Crypt 5, Crypt 6, Crytp8 file to DB Database without Key on your Android Phone and tablets. 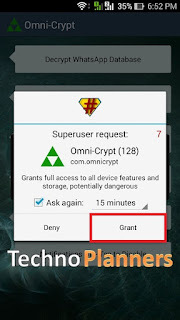 Before Convert any Crypt file to DB from your phone you have SuperSU permission on your device. We also attract a video tutorial. By-Default Root is the user name and password to access all system applications and data-files on the Android Operating System. With Rooted Android Device you can install Unapproved Application by Play Store Like WhatsApp Plus, OG YouTube, Greenify, Root Explorer, etc. With Root access you can change the boring boot animation in Marshmallow boot animation. Just check out How to Install 6.0 Marshmallow Boot Animation on Android. You can also Install Custom ROM Like CyanogenMod, SlimRoms etc. The famous Communication Application WhatsApp is available on the popular platform like Android, IOS and Windows Phone. WhatsApp Store incoming and outgoing conversation in Crypt5, Crypt7, Crypt8 file format in device internal store. You can find in folder path Device/WhatsApp/Database/. WhatsApp Viewer help to open and read the database WhatsApp conversation on your PC. WhatsApp viewer also helps to decrypt.Crypt5, Crypt7, Crypt8. File into database using Key file. You can also save chat history in HTML or text file. Download Omni-Crypt Application and WhatsApp Viewer from end of post link given. Install Apk file on your Phone, Open it and Tap on Decrypt WhatsApp Database. 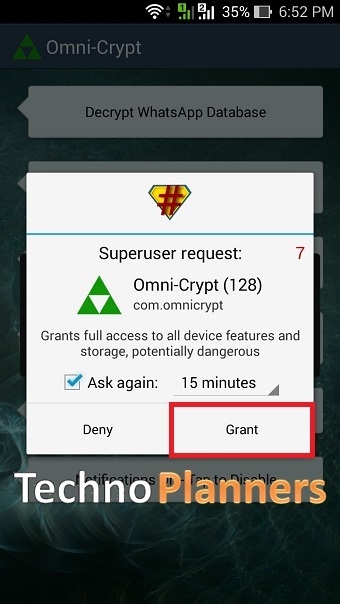 Grant SuperSU permission if ask. After Decrypted Complete, Open file manager and go to path Internal Storage/WhatsApp/Databases/here. Now Copy msgstore.DB file and Paste in SD-Card or Internal Store without folder. Connect your phone with PC using Data cable and Copy msgstore.db file on your desktop/PC. Now Extract WhatsApp viewer using WinRAR or other Zip extractor tool. Run WhatsApp Viewer on your PC, Now Press Ctrl + O button from keyboard. Once Open WhatsApp Database pop window open on your Screen. Now from File option, Click on Browse button to select msgstore.DB file. Once you select msgstore.DB file, click on OK button to view WhatsApp conversation. You can also Save a conversation to text or HTML file format. Share this Decrypt WhatsApp Database tutorial with your friends and family. 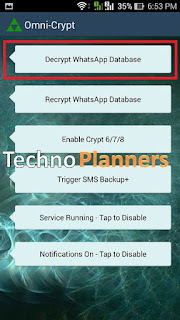 How to Decrypt Whatsapp Database Crypt12 without Key?